A Nevus Sebaceous is a birthmark that has a yellow/orange color. It presents most frequently on the scalp of a newborn and is smooth in texture. It may look patchy and the area is without hair. A nevus sebaceous forms as a result of the overgrowth of sebaceous glands. A nevus sebaceous secretes sebum, a waxy substance, causing the surrounding hair and skin to be waxy. If your baby was born with a nevus sebaceous, you will want to seek evaluation for this condition as it can become a skin cancer later in life if untreated. 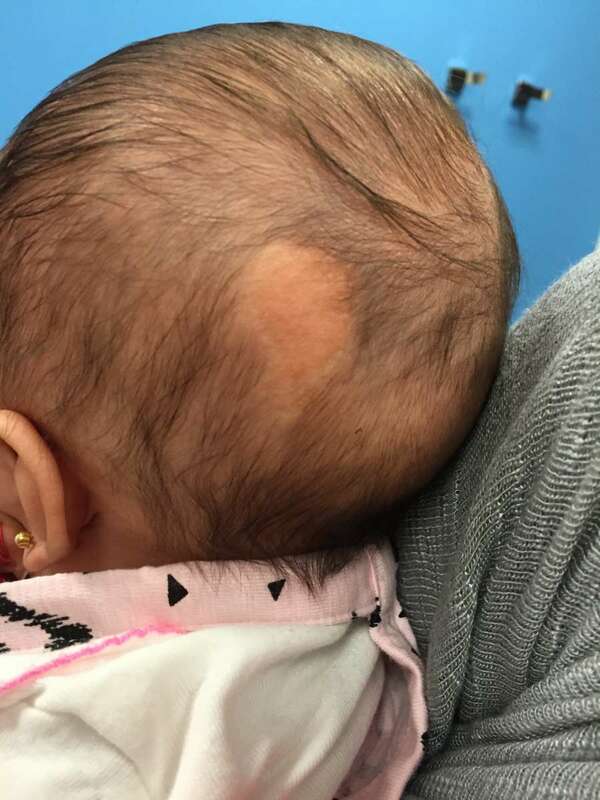 In addition, when nevus sebaceous surgery is not performed, this subjects your baby to large patches of baldness in those affected portions of scalp. Dr. Nicholas Bastidas is credentialed in both pediatric and adult plastic surgery. is widely know as an expert on nevus sebaceous surgery. The selection of a plastic surgeon for your baby is an important decision for parents and Dr. Bastidas' patients and families experience a physician committed to safe, high quality care and excellent communication throughout the process. 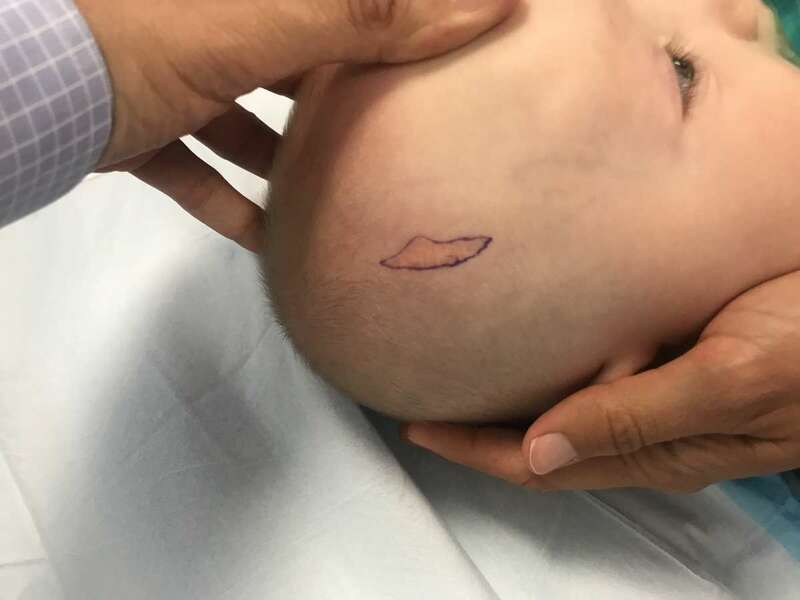 Dr. Bastidas and his team know how important it is to communicate well with patients and their families before, during and after nevus sebaceous surgery. The cause of nevus sebaceous is not known, but it may involve genetic mutation. A familial pattern of nevus sebaceous is sometimes seen. Nevus sebaceous, though an uncommon condition, can be present at birth but can also occur at any age. There is no stronger tendency to present based on gender or race. There is an incidence of some nevus sebaceous birthmarks becoming cancerous (basal cell carcinoma) and nevus sebaceous surgery is often recommended in order to eliminate this risk. If an adolescent patient is brought to Dr. Bastidas, nevus sebaceous surgery is often recommended because hormonal changes associated with puberty can activate glands within the birthmark and increase the risk of skin cancer developing. Scratching may lead to bleeding or an ulceration. Dr. Bastidas is trained in techniques for nevus sebaceous surgery. The most frequently-used technique by Dr. Bastidas for nevus sebaceous surgery is direct excision. Because of Dr. Bastidas professional skills as a plastic surgeon to both children and adults, he uses special reconstructive techniques that will minimize scarring and ensure an attractive, natural looking result for his patients. Dr. Bastidas can often remove nevus sebaceous under local anesthesia in the office. Parents are allowed to remain in the room to help keep their child calm. Dr. Bastidas recommends early excision given the skin laxity in infants and the ability to perform local anesthesia without the need for general anesthesia. Healing after nevus sebaceous surgery is quite rapid and generally most children are fully recovered within 2-3 weeks. Insurance most often covers this procedure. If you would like to know more about nevus sebaceous surgery, a great place to start is Dr. Bastidas' websites: www.DrBastidas.com and www.ippcs.org. Dr. Bastidas is a founding partner in the Institute of Pediatric Plastic and Craniofacial Surgery, a collaboration of multidisciplinary physicians from a range of specialties who work together on a full range of complex surgical cases. Because of their consultation and work together, surgical patients of Dr. Bastidas benefit from this multidisciplinary approach.